It’s been a while since The Digital Moose Lounge (“DML”) has sent a newsletter or posted a blog. We’re really sorry about that. We’ve taken a little pause the last three months to stop and smell the maple syrup, catch up with some DML members over a double-double and timbits, met with the Prime Minister of Canada at the San Francisco Fairmont, and saw some changes of moose leadership on our board --- which led to an update to our mission. Read on for more about what we’ve been up to. If it’s your first time hearing about DML or you're new to our group, you may be surprised to learn that DML was 'born' about nineteen years ago. 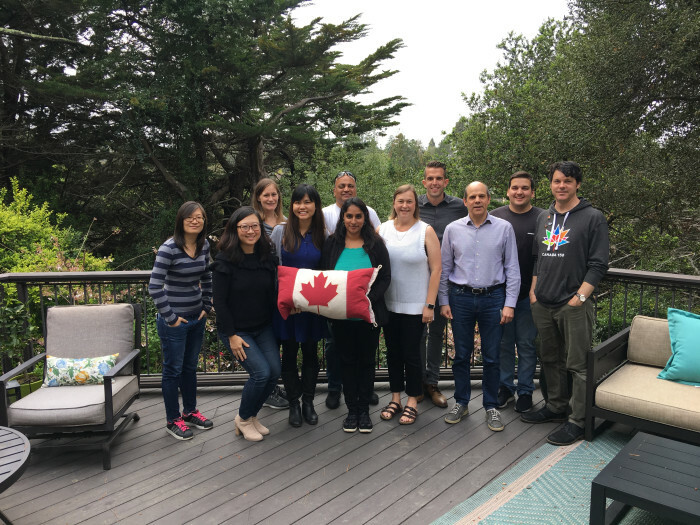 When a handful of Canadian expats in the Bay Area teamed up to create a social and business networking group in partnership with the Consulate General of Canada, which became The Digital Moose Lounge. This was during the “dot com” boom when Canadians found great commercial and career opportunities in real estate and internet companies in the Silicon Valley. Throughout the years, The Digital Moose Lounge has continued to serve as a hub for Canadian cultural activities and as a ‘second home away from home’ for the multitude of Canadians who have emigrated to the Bay Area. Those who came to DML-hosted events, formed a community who shared the same culture and values as those from ‘back home.’ People who laughed at Canadian anachronisms and wouldn’t flinch if someone added a ‘u’ in words like ‘favourite.’ Perhaps more significantly, DMLers forged meaningful relationships that turned into strong friendships, business partnerships and even a few marriages! In the last few years, with its strong network of Bay Area Canadians and lovers of all things Canada, the DML has become the first point of contact for government representatives, university alumni, and corporate leaders among others who were seeking to connect with Canadians. At the end of 2017, after Canada’s 150th birthday driving much of the DML agenda, our Board knew it was time to re-evaluate the trajectory of The Digital Moose Lounge. With membership doubling in recent years, DML events got bigger and better, which for a tiny non-profit was an astounding feat. We are ready to be more strategic about our growth so that our DML community members and volunteers are benefitting even more. Another change in the local landscape that drove our decision to update our mission is the exciting growth of other Canadian networks with business and social purposes to serve the local Canadian community. And so, the DML Board explored several ways to build upon the success of the past two decades. Through this revisioning we are excited for members to be more involved in efforts that deliver social impact and benefit to our local community of Bay Area Canadians. The DML promises to still be a hub for Canadian cultural activities and a space where you can build meaningful connections with other Canadians that will help your social and/or business lives. A safe place where you can proudly wear your plaid, toques and bunnyhugs, and declare your love of Old Dutch ketchup chips and find others who share these passions. The difference is in how we do that; we will be more focused on supporting Canadians making an impact on the world. We want to be able to shine a light on Bay Area Canadians who are DOING GOOD and making where we live a better place (Join us for a May 2 Chesterfield Chat to hear from local Canadians helping undocumented immigrant community in California). And, if you are a bay area Canadian who’s passionate about community service or a social impact cause, and/or want volunteers for your effort -- we’re interested in collaborating with you! Erika Wah has served The Digital Moose Lounge since 2014 as a director on the Board. She nurtured relationships with BC sponsors, helped the Board through its recent revisioning, and introduced many Canadian alumni to the DML. Griselda Zhou was director on the Board from 2015-2017. She led the web committee and successfully redesigned the website to be more consumer-friendly and in to an online resource for members. Please help us thank Erika and Griselda for stepping up as Chairs and send them your well wishes. And help us thank David Stewart for his leadership the last three years. You can read more about our board and upcoming events on our website. We have some exciting things on the horizon and we want to hear from you! What do you think of The Digital Moose Lounge’s direction? Do you have memories or stories of the DML you could share with us? Do you know a Canadian that is ‘doing good’ and making a social impact? We’re always looking for volunteers too, so let us know if you want to get involved on a committee or board check out our volunteer page. You can share send us a note at programs@digitalmooselounge.com or reach us on our Facebook page.